Being a poet gained Geoffrey Chaucer entry into many nobles' courts, but it did not pay his rent. According to biographer Peter Ackroyd in his compact volume Chaucer, to keep his apartment above Aldgate Gate, where he could see everyone entering and leaving London to the east, the son of a wine merchant had to keep accounts for the King, gather tariffs and taxes, and represent the British crown on missions abroad. While in Italy and France, Chaucer always listened to the poets, noting their cadences, voices, and storytelling. In London, when not involved in lawsuits, he wrote and recited his poems. 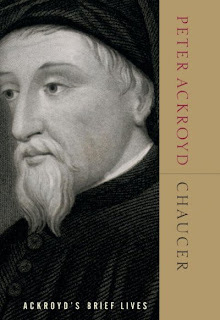 Ackroyd says that Chaucer was very private and guarded person in many ways. He had to be in the employ of the crown in an especially violent time in London. There were many kidnappings, murders, and rapes, the latter a crime of which the poet was accused but settled out of court. Reading the poetry is one of the keys to understanding him. His work shows him to have a complicated group of interests and to be drawn more to bawdy comedy than art. He was more heard than read in his own time, as he presented his poems at many social gatherings. Chaucer was not the first British poet, but with Troilus and Criseyde and Canterbury Tales, he wrote the rules for the next seven century of English verse. Ackroyd quotes extensively from them without translating the Middle English to modern spellings. I was surprised how much I could read of it if I sounded it out. In the introduction, the author states that this is the first of a series of Ackroyd's Brief Lives. He added J. M. W. Turner to the series in 2006 and will release Newton later this year. Libraries should consider them all. Ackroyd, Peter. Chaucer. Nan A. Talese, 2005. 188p. (Ackroyd's Brief Lives). ISBN 0385507976.